US Democratic presidential candidate Barack Obama has blamed the administration of Republican President George W. Bush for straining the country's ties with Turkey, its NATO ally, and pledged to lead efforts to bring Turkey and the Iraqi Kurds to find a solution to the terror threat posed by the outlawed Kurdistan Workers' Party (PKK). 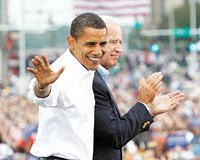 In a blueprint of his plans to create a stronger partnership with Europe, Obama said he and his candidate for vice president, Joe Biden, believe a close relationship with "a stable, democratic, Western-oriented Republic of Turkey" is an important national interest for the United States. "That relationship has been deeply strained in recent years, most importantly by the Bush administration's misguided and mismanaged intervention in Iraq, which has helped revive the terrorist threat posed to Turkey by the separatist Kurdish Workers Party [PKK]," the document, published on his election campaign Web site, said. "The result is that this strategically important NATO ally, the most advanced democracy in the Muslim world, is turning against the West," said Obama and Biden, recalling recent opinion polls indicating that the number of Turks with a favorable opinion of the United States had fallen to 12 percent. "Barack Obama and Joe Biden will lead a diplomatic effort to bring together Turkish and Iraqi Kurdish leaders and negotiate a comprehensive agreement that deals with the PKK threat, guarantees Turkey's territorial integrity, and facilitates badly needed Turkish investment in and trade with the Kurds of northern Iraq," said the document. None of the Turks with whom I have talked seem to think of Obama as a hugely transformational figure, though many are impressed that an African American, and someone many see as sympathetic to the Third World, has a chance of becoming president. A good number of people with whom I talk still are resoundingly convinced Obama has no chance, and some even suggesting he is part of a right-wing conspiracy in the United States--a charade to be thrown up to make the eventual election of John McCain look democratic. However, almost all think if Obama does win the election, Turkish-U.S. relations will improve, and the border with Iraq might become more stable.